Crystal basket 20cm. Red Gold. At this time this product is currently out of stock and is unavailable to order. Crystal basket for the Red Gold Collection. Diameter 20cm. Bohemia crystal decorated with 12-carat gold. Hand decorated and engraved. Crystal basket for the Red Gold Collection. 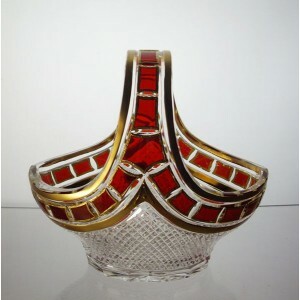 Bohemia crystal decorated with a red stain and 12-carat gold edging. This collection combines colour with beauty to create a dynamic and vivid item. Crystal basket 20cm. Classic Collection. Box of 2 whisky glasses. Red Gold Collection. Box of 6 Champagne glasses. Red Gold Collection. Box of 6 Cognac glasses. Red Gold Collection. Box of 6 port glasses. Red Gold Collection. Box of 6 water glasses. Red Gold Collection. Box of 6 whisky glasses. Red Gold Collection. Box of 6 red wine glasses. Spiral Collection. Turtle figurine in crystal. Size : 10cm. Crystal vase 26cm. Decoration Contrast. Box of 6 Champagne glasses. Le Cristal et l'Or. Box of 6 Champagne flutes. Sophia Collection. Set of 6 Champagne flutes. Dionys collection. Crystal vase 31cm. Decoration Fantasia. Crystal vase 27cm. Classic Collection.